Alexandra Sandor is a colleague dear to us and 3 things she loves about Office Depot are: the people, the role itself and the constant drive for learning & development. Below, you can find more details about her trip in our company. I’m friendly, I try to smile a lot and I like numbers, that’s why I’m working here. I like to travel as much as I can. After work, I try to see a movie, read a bit, and take walks. I am team leader in a Cash Application team. I make sure that everything is done on time, correctly and the people are happy with the team, with what they do here. 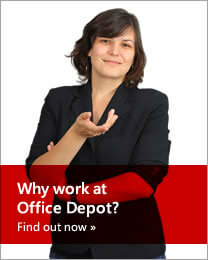 I came in Office Depot as a Process Assistant for UK and Ireland. It was the first region which was transferred here. We tried to make the days as fun as possible. We used to print all the documents we had and the printers couldn’t cope with the volume. We even had a picture with the printer – it was like a flower because of the paper. I came with a colleague with who was living in the same area; we would drive together to work and pick another colleague to go to Muncii’s Street. I knew few of my colleagues, because we used to work together in the previous company. We had a health and safety training which kept all day long. We didn’t know what team we were part of, we didn’t know who was our team leader, or manager. Then we were communicated the schedule, the team and working hours. The team leaders were not in Romania at that point because they were still transitioning from UK. We started the training with the team leaders from UK. In the Cash Application department we didn’t have direct contact with the client and we didn’t have any phones in the desk. There were 2 rooms in the old building: on the one side the collection team and the cash app; accounts payable and collection team – contracts side – on the other. Because we didn’t have any phones, we had to walk to the other desks and interact more with the people. A few years ago the Cash Application Department reorganized. I had a girl in my team, she was a new joiner, and I was the only one called Alexandra in the team. She came back from holiday, came to me and asked me in a low voice: ‘Do you know who Alexandra is?’ And I looked at her and replied: ‘It’s me’. Also, there were some moments when someone came and told me that Google mail was not working. And I asking: ‘Did you check the other monitor that is switched off?’. I guess the biggest achievement is starting working with people. I like numbers as I said before but managing people it’s been a challenge for me. Getting into a level of comfort in this role and adapting to each person – I believe this is my biggest achievement. We have in Cash Application a large team so it’s not always easy and you have to adapt to each personality. I think of how the managers used to say: walk the talk. Yeah, be an example for the rest of the people, be fair and objective, be transparent, and communicate as well as you can, don’t take things personally and do your best and get involved in what you are doing. 8. What were the biggest challenges which you faced here? How did you manage to solve them? I think for me it was not being on the same page with the managers at times. Of course there are technical issues but that can be sorted out. But first of all, I speak my mind and try to discuss it honestly: what bothered me, how we can work this out, etc. I always emphasize on being fair, because if not, then people get frustrated and they don’t feel good about most of the things. What I try to follow is not to do to others what I wouldn’t like to be done to me. So, I ask myself before acting: “would I like that, would I want that, would I like people to treat me in a certain way or another?”.